Rajasthan is royal state of the India. Pushkar is greatest destination located in the Rajasthan. Pushkar is known for the holy town in the state Rajasthan. That amazes people for its unique charm of holiness. People love to spend their holiday visiting to the very religious destination along with the places that flourish around a great water body must step in to the holy land of pushkar. Pushkar is a land which is filled with the attractive beauty with a great otherworldliness pushkar. This delightful place in the desert state is very much nearby to Ajmer and pushkar is 140 kms away from the jaipur. Pushkar is the home of the several pleasing locations, early times temples, lovely water bodies and in the last but not the least the pushkar fair. Pushkar is deep in its immense holiness and this is a great importance this excellent region is known as ‘Tirth-raj’. Pushkar is the best destination for those who want to become a part of rich rajasthani culture and tradition. So take a tour of pushkar and enjoy for being a part of Rajasthani culture. Pushkar is holy place, it is described that one must visit destination for the Hindus once in a lifetime and this was mentioned in the Hindu mythologies. Pushkar is a small city which is surrounded by hills on the three sides. Pushkar is one of the ancient city in the India. Pushkar is famous for its pushkar lake. It was believed that pushkar lake is formed by the tears of lord shiva and the brahma temple. The fabled city pushkar is associated with Brahma the lord of creationas it was said that Lord Brahma jimself performa yagna to protect the whole region from the demon attacks. Pushkar is a spectacular location which has its role in the epic Mahabharata and Vaman purana. In the ancient times, the rajputana city is ruled by the chichi gurjars and later by kanpahti jogis. The holy town pushkar is famous as this is an important and a pivotal place as it hosts the only temple of Lord Brahma. 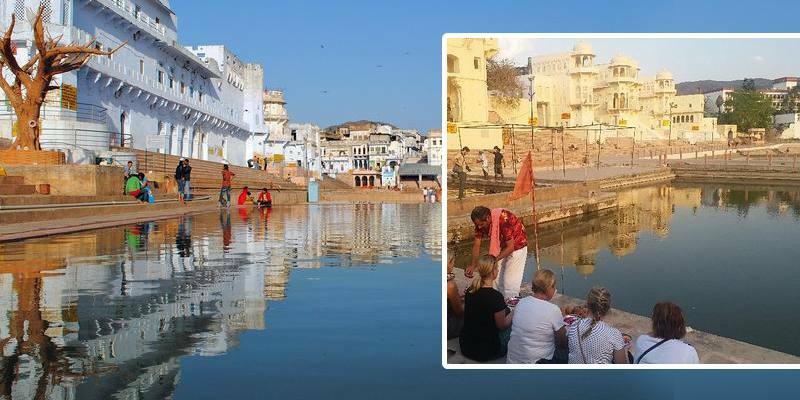 The lake in the pushkar is considered to be very special that is described that once in a lifetime people come to pushkar and tend to take a dip in the holy water of the pushkar.